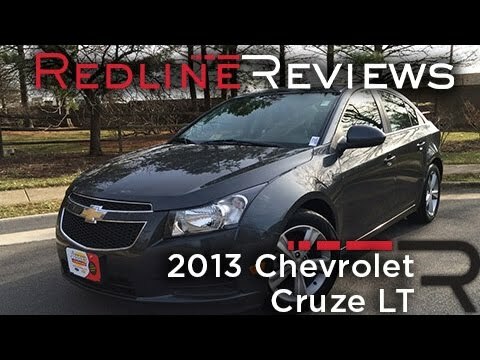 With the 2013 Cruze, Chevrolet looks to edge out the competition by offering a fuel-efficient sedan with a more upscale look and feel but without a significant increase in price. If the Cruze's quiet cabin, smooth ride and numerous upgrades aren't enough to lure devout import buyers into Chevy showrooms, we're pretty sure the car's excellent fuel economy will do the trick. Small silver car with transparent windows. Seats are comfortable. I have loved my experience driving a Chevy Cruze. It drives very smoothly and it is very good on gas mileage. It is easy to drive and has many helpful features, such as, the temperature outside the vehicle and inside the vehicle. Additionally, my car lets me know exactly how fast I am going and exactly how many miles of gas I have left so I never run out of gas. As far as issues, the fan in my car broke so for a while I did not have air conditioning or heat. My transmission also had a leak. I do wish that the speaker in my car was a little bit louder, but it definitely gets the job done. I have had my car for a few years and I have put hundreds of thousands of miles on it and yet it still drives like it is brand new. The trunk is pretty big and can be accessed from inside the vehicle. However, unfortunately you cannot pop the trunk without turning off the car and taking the keys out of the car completely. That is something that can be very frustrating at times. Chevy Cruze: the built in features are really convenient to everyday living. I have had my car for two years. I lost my first car which SUV. When I was looking for a new car, I initially wanted another SUV. The salesman suggested that I take the car for a test drive. I like the fact the car has a remote control and you can start the car prior to getting in. The car has OnStar and Sirius (which is an additional cost) but I love it. I can have on star map out my directions. I listen to various types of music (do not have to switch radio stations) on a long trip. I receive a monthly update regarding the mechanical status of my car. I like this feature at a glance I know my tire pressure and if I need to have my oil changed. My car seat can be heated when necessary, great when it is cold. Mileage is good also. The trunk space is large and deep for luggage and groceries. The remote will also open the trunk prior to reach it. Great feature when your arms or full or the weather is implement. Great purchase, just a couple minor kinks. The size and style of the car is perfect for someone who likes a comfortable interior without a large vehicle. Great and easy to navigate dash. Comfortable seats, smooth ride and good steering. It has steering wheel controls which are important for me with little ones in the car. I do not like that the USB input for mobile phones, iPods, etc. is shotty and does not work half the time. While I've grown to be cognizant of it, the low frame of the vehicle does make driving on certain surfaces difficult with clearance. Overall, it's a good car and I've been pleased. It's lasted through a lot of long drives for me and I feel very safe in it.